Contact Our Firm if You've Been Charged with a Drug Crime. We Have the Experience & Courtroom Skill to Establish a Successful Defense. Being charged with a drug crime in Spokane, Washington can result in some very serious penalties if you are convicted. It is important that you have skilled representation on your side that can help you aggressively pursue a favorable outcome in your case. Attorney Steve Graham is a successful trial attorney with proven results, and he can put his extensive skill and experience to work for you in your case if you choose to work with him. Drug Possession - If you are found to be in possession of controlled substances, then depending on the amount and type of substance you are charged with possessing you could face extremely harsh penalties for conviction such as years in prison, and hefty fines. Drug Sales or Delivery - Being charged with the crime of drug sales or delivery can result in serious criminal charges. Gifting or drugs that merely change hands can be considered delivery. If you are seen handing drugs to another person, even without the exchange of money, then you could be arrested and charged. Possession with Intent - If you are charged with the crime of possession of controlled substances with the intent to sell, then you could be arrested and charged with a serious offense. The penalties that you may face will depend on the type and amount of substance found in your possession. Drug Manufacturing, Cultivation, or Importation - Creating drugs, growing substances, and importing controlled substances are all illegal actions and could result in severe criminal charges. Your case is important to this lawyer, and it is important that you have skilled representation on your side! Drug Paraphernalia - Possession of drug paraphernalia is a serious crime in Washington, and you could be facing severe penalties for a conviction. Drug Paraphernalia can include objects such as a syringe, a bong, or other objects related to drugs and their use. Drug DUI - If you are deemed impaired while driving, then you could be arrested for DUI and you could face serious penalties for conviction. Some are known to cause judgment impairment as well as visual impairment in some cases. 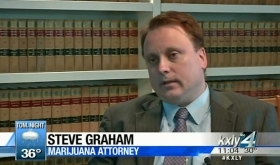 With over 20 years of experience in handling various criminal defense cases, and years of experience as a prosecuting attorney, the Law Office of Steve Graham can provide you with the defense of your case that you need. We offer free case evaluations so that you may obtain legal advice and information regarding your case without any financial obligation.